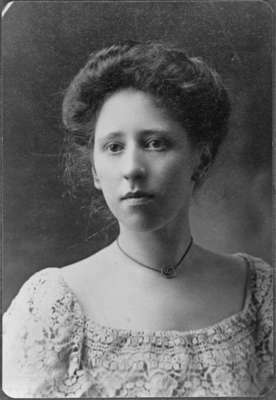 A black and white portrait photograph of Mrs. Geoffrey Clive St. Jermain Steadman (Agnes Wickfield Dow) (1879-1961). Agnes Wickfield Dow was a daughter of Whitby lawyer John Ball Dow. She was born at Whitby on October 16, 1879. In 1912, she married Geoffrey Clive St. Jermain Steadman. He died at Montreal in 1915 and she travelled to England with her son where they lived with her brother-in-law in England. She died at Wallingford Castle, Berkshire, England on August 2, 1961.